If you found the recent New York Times pieces on the making of Apple products to be interesting and “Mr Daisey and the Apple Factory” to be enlightening, you’ll probably enjoy this ABC Nightline report on Foxconn. ABC’s Nightline was given exclusive access to a Foxconn factory in China that assembles Apple products, providing a fascinating look at how Apple gear is made. 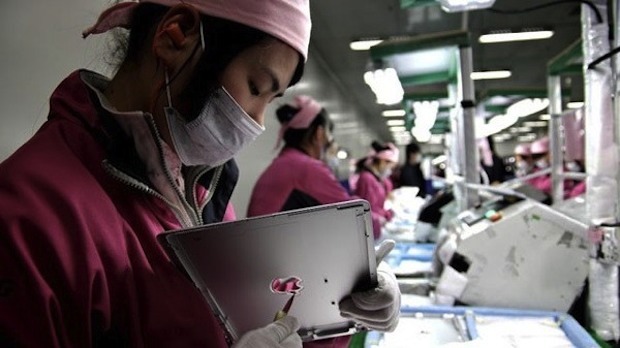 You’ll see iPhones, iPads, and MacBook Pro’s being put together manually by workers as there’s virtually no robots or automation, nearly all of the devices are assembled by hand. This means it takes a while to produce each Apple product, and a single iPad takes nearly a week to complete. It’s not exactly a groundbreaking documentary, but if you are an Apple fan and user of Apple products, it’s worth watching. The show is about 15 minutes long and has been embedded below or you can watch it on ABCNews.com. Why Aren’t Apple Products Made in America? Interesting: ABC is owned by Disney who bought Pixar, making Steve Jobs then Disney’s largest stock holder. The quality of this report is about what I’d expect from Good Morning America. It’s vapid, inconsequential, insignificant, and typical of the US media. Can’t make them fast enough? They can if they use robots (a Chinese industrial worker but then electric) but a shortage means a higher price, come on, that’s basic economics. LOL…if gasoline was defined in China and bring the gas price down to $1, will we say anything?